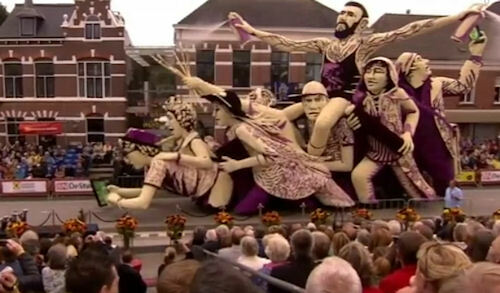 On the first Sunday of September every year since 1936, Zundert - a small town in the south of the Netherlands that is the birthplace of Vincent van Gogh - puts on the world's largest volunteer-run flower parade, with a raft of over-the-top floats made from local dahlias. This year, Corso Zundert 2016 did not disappoint, with bonkers-looking entries from competing local districts electrifying the streets of the town in the form of outsize flower-based foxes, red-haired ladies, dragons, and other creatures and abstractions, with each 66-foot-long, 33-foot-high float made from some half a million dahlias. You learn something every day :-) I'd always believed Vincent was born in Nuenen. Vincent van Gogh was born in Zundert in 1853. He went to middle school in Tilburg (the city where I live) from 1866 till 1868. He lived in Nuenen from 1883 till 1885. In November 1885 Van Gogh moved to Antwerp and in 1886 to Paris.